This is the second iRobot I have bought. I have a really old one that is still running good. I just need more cleaning. I have a big house. I am super impressed with how long and how well these little robots work. I love mine and 2 actually work really well together. This Roomba works great. It has a larger collection bin than the older models, soft brush and is easy to empty and clean. I am able to schedule cleanings and the wi-fi and app lets me know if it is done or if it has a problem. I was skeptical at first because I thought it was a bit pricey, but I've come to realize it's then best investment for my house! Cleans both my hard wood &amp; tile flooring beautifully. Cleans my throw rugs just as well. Love how I can program remotely with my phone. After a busy day at work, I come home to perfectly clean floors. So convenient! So far I have used this a few times and I am pretty impressed. I have a cat and it was getting to be a lot to keep up with all of her shedding. Enter roomba. I think the biggest thing here to be aware of is that this is not a roomba that will map your house, I.e., there are spots that your roomba may go over several times and other spots your roomba may miss. This is not a big deal if you're running it several times per week and not watching exactly where it goes. This is easy to schedule cleanings with the app, perfect for when I don't want to be bothered with the noise at home, although it is not that noisy, quoted than a typical vacuum. If you have particularly high pile carpets/rugs, this will not be able to navigate over them. I have a very shaggy rug in my bedroom, which the roomba can not get on top of. It also will not go over the thresholds into different rooms, if they are particularly high. I am very happy with this purchase, however. I have chronic pain and lugging around a vacuum was not an option anymore. I was hesitant about purchasing a Roomba because I wasn't sure it would stand up to picking up fur from two dogs, a cat, and three girls with long hair, in the home, but amazingly, it does that and more! I like that I can control it with an app, through my Amazon Echo, or just by pressing the button on the top. I also found the enclosed sensor useful in keeping the Roomba away from my dogs water bowl. 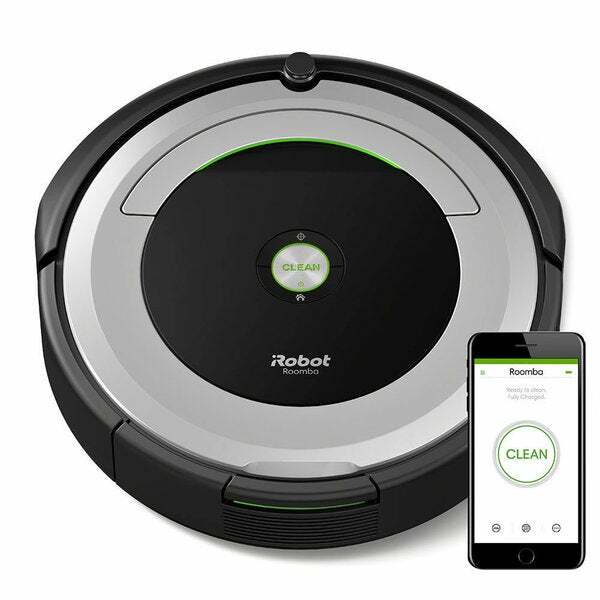 Overall we are VERY pleased with the iRobot Roomba 690 Wi-Fi Connected Robot Vacuum. I suggest it to everyone! This is wonderful. It does exactly what I need it to do. Wonderful under the bed and couch. It even went between my dining chair legs. Not once got stuck. I love my iRobot Roomba. I have two dogs, so my Roomba is essential in helping me keep my floors looking clean. It is amazing how much dog hair is cleaned on a regular basis. Had this product almost a year and it is great, cleans up very well but you have to clean it out after every clean. Battery stays long and runs a while, great for a 1200 sq foot home and also if you have pets it picks up the hair very well. This everything they advertise and more. I had wanted one for a while but was somewhat skeptical about price vs quality of the machine. Don't doubt any longer. We have a Golden Lab and Long hair tabby in our home. This machine keeps the fur balls GONE. We operate it from an app on our phones and set it to work, it runs for about an hour and returns to the docking charge station when it is done. We run it about every other day. Our lower floor is about 1600sqft. it vacuums it all. Even under our king bed. Love it, and considering the mop version. The iRobot Roomba 690 is great, although it is not really all that thorough. It misses little areas however it is wonderful to come home to a vacuumed house! I highly recommend it. This is the baby of the line, I feel like the upper models are probably more thorough. I love that you can program it from anywhere! My first IRobot. It does the job. Save me a lot of time seeeping my hardwood floors. I love my roomba, this is the best investment my family made. Only thing is she is not holding charge and she gets stuck a lot of places in the house and shuts off, often we can’t find her in the house. But by far the best purchase we’ve made. Love this. I can set it to vacuum and leave for work. When I return, the floor is clean. The IROBOT Roomba 690 works just as we hoped! It’s amazing at picking up the hair our collie sheds...even when we don’t see it. Works great on hardwood and carpet alike. "How high it will go over thresholds, We have them in every room"
"can you program this unit without a smart phone"
No the App controls the programing and status messages. Otherwise it has a manual start and stop. "Will it travel between rooms if the floors are not completely flush? There is a slight lip between my main living area and the bathroom and kitchen. I'm hesitant to spend so much if I'll be stuck sweeping the 2 floors I hate the most "
"does this leave those freshly vacuumed lines?" "Is this model a more quiet type? I have the model right before this and it’s a little loud. " I find it is slightly loud. I have to turn the volume up on the TV if I'm vacuuming while watching anything. I wish it were a little more quiet. "Will this model vaccum any color of carpet"
Yes! I have a cream colored carpet and it cleans it wonderfully! I have two dogs, a long haired cat, and three girls all with long hair, it picks up everything and leaves my home clean. It comes with a small cleaning tool, for cleaning the brushes-I highly recommend checking and cleaning those brushes regularly. Also, check and clean the trap, for dirt and fur. It's super easy to clean the trap, just list the yellow tab and dump into the trash. Need something to assist with cleaning the floors which gets a lot of dust balls. Not sure. I liked it was 5 star and what it did. A lot of different ones. Price and coupon. I order this for my daughter for Christmas. So we shall see.